18th century map depicting southwestern Spain. 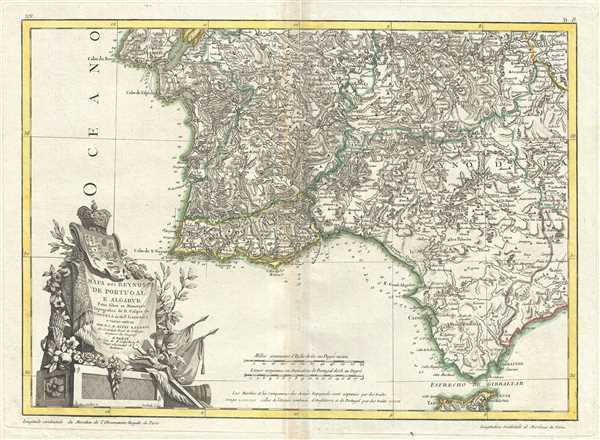 A beautiful example of Rizzi-Zannoni's curious c.1778 map of southern Portugal, the Algarve, and southwestern Spain. Covers from Lisbon south to Gibraltar and east as far as Andorra, Spain. Engraved in a highly unusual topographic style, this map offers excellent detail throughout showing mountains, rivers, forests, national boundaries, regional boundaries, forts, and cities. A large decorative title cartouche depicting the heraldic crests Portugal and the Algarve appears in the lower left quadrant. This is one of the most highly detailed maps of southern Portugal to appear in the late 18th century. Drawn by Rizzi-Zannoni around 1778 for issue as plate no. B 8 in Jean Lattre's Atlas Moderne. Very good. Some toning and wear along original centerfold. Minor foxing. Original platemark visible.